The new Bowel Scope Screening programme: Who is taking part? In March 2013, the NHS in England introduced the Bowel Scope Screening programme. This is a one-time only screening offered to people at age 55. Bowel scope screening is a test (also known as flexible sigmoidoscopy or flexi-sig) done by a specially trained nurse or doctor. They use a thin flexible tube with a tiny camera on the end to look inside the large bowel. The screening looks for growths or polyps in the bowel and, if they find any, can be removed straightaway. Bowel polyps are harmless but if they are not removed, these polyps could turn into cancer. Therefore, by removing pre-cancerous polyps, the screening test helps to prevent bowel cancer. The test can also find cancer that is already developing and detecting cancer early increases the chances of successful treatment. A previous large study showed that screening using flexible sigmoidoscopy can prevent bowel cancer by removal of pre-cancerous polyps and significantly reduces bowel cancer deaths. This evidence led to the introduction of bowel scope screening within the NHS Bowel Cancer Screening Programme. The bowel scope screening programme is being rolled out in stages. Our latest study is the first to look at the participation rates within the new bowel scope screening programme for the first six screening centres. Getting the full public health benefits of screening depends largely on how many people take part and go to their screening appointment. In the first 14 months, these six centres invited 21,187 individuals to have bowel scope screening: 43% of those invited had the screening test. This is encouraging for a fairly new and invasive test, especially as there are currently no publicity campaigns for bowel scope screening. What is most worrying in our findings is that people living in poorer areas were less likely to take up the screening test (33%) than people living in more affluent areas (53%). Differences in uptake could mean that people from more deprived areas will be much less likely to benefit from this test. This might create inequalities in the number of people diagnosed with late stage bowel cancer when treatment is often more invasive and outcomes less favourable. Interestingly, men were more likely to go for bowel scope screening when invited than women (45% vs 42%). This is surprising as women are more likely to participate in the existing bowel cancer screening programme which uses a test done at home, called faecal occult blood test (FOBt). Women also have high rates of uptake for breast and cervical cancer screening. The uptake rate also varied between the six centres, partly because of differences in deprivation but mostly because of other service-related differences which are yet to be explored. Bowel cancer is common but bowel scope screening helps prevent it. Although the initial participation rate is encouraging, the differences in uptake between more deprived and more affluent areas are a concern. Bowel scope screening will be fully rolled out in England by 2018 and in light of its huge health benefits, we need to invest in strategies to increase public participation and to narrow inequalities in uptake so that everyone has the chance to benefit from this screening. This analysis is part of an ongoing larger study (Flexi-Quest) funded by Cancer Research UK which wants to find out what people think about bowel scope screening, and why some people may be less likely to go for screening. This first look at the data gave an indication about differences in participation rate; however, the findings show that there could be other factors important for participation. As part of Flexi-Quest, we will be conducting surveys and interviews that aim to identify ways in which we can remove barriers and reduce inequalities in bowel scope screening. Atkin W, Edwards R, Kralj-Hans I, et al. Once-only flexible sigmoidoscopy in prevention of colorectal cancer: a multicentre randomised controlled trial. Lancet 2010;375:1625–33. Public Health England. NHS Bowel Cancer Screening Programme: NHS bowel scope screening, http://www.cancerscreening.nhs.uk/bowel/bowel-scope-screening.html (2015, accessed 26 August 2015). Type Jade Goody’s name into Google Images and you find an array of pictures from bouncy Big Brother star, through smiling but bald cancer patient, to pain-wracked dying woman. Jade was diagnosed with cervical cancer in 2008 and died at the age of 27 just a few months later. Her tragic story received unprecedented media attention and the general public were privy to the intimate details of the last months of her life. 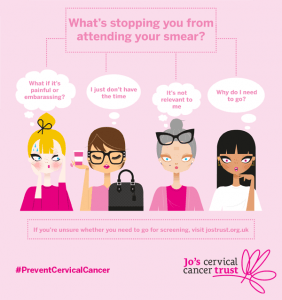 In what has become known as the ‘Jade Effect’, her story had an extraordinary impact on women’s participation in cervical screening – we think about half a million extra women went for screening during the time of her illness. As psychologists, we were interested in which women were influenced by Jade’s story and why. To try to understand more about the Jade Effect, we did a survey of 890 women in England – all of them within the age range that are offered screening.. We collected information about women’s age and their social background and we asked them if they’d been affected by Jade’s story in their decisions about cervical screening. The survey was done about 18 months after Jade’s death, so we asked women to think back over that time period. The most interesting finding was that younger women were more influenced by Jade, and so were women who had children at a younger age, and who came from more deprived backgrounds. So why do we think this is? Well, Jade was 27 when she died, and it’s no secret that she had a hard childhood in Bermondsey – hers was a ‘rags to riches’ story. She also had children young – in her early 20s. So it seems possible that the women who were most influenced by her were those who could identify with her. Perhaps there was a sense of ‘it could have been me’ – and this was the prompt they needed to go for screening. Suddenly the stakes were raised and the barriers to having a smear test didn’t seem so important. It’s also possible that some people are more affected by stories than facts. The blanket media coverage and the emotional story of Jade’s illness probably affected people very differently compared with the kind of factual leaflets that are usually used in screening programmes. It could be a case of heart vs. head, and perhaps as psychologists and health educators, we need to realise that stories, or ‘narratives’ as they’re sometimes known, can be a good way to get our message across. Lancucki L, Sasieni P, Patnick J, Day TJ, Vessey MP. The impact of Jade Goody’s diagnosis and death on the NHS Cervical Screening Programme. J Med Screen. 2012 Jun;19(2):89-93. doi: 10.1258/jms.2012.012028. Epub 2012 May 31.